MaryTherese Grabowski’s new book “Your Vote Counts!” is a wonderfully patriotic story that is a great read for the whole family. 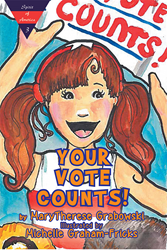 Recent release “Your Vote Counts!” from Page Publishing author MaryTherese Grabowski with her illustrator Michelle Graham Fricks is a real world story that teaches why everyone’s vote counts whether the reader is young or old. Author MaryTherese Grabowski has completed the third book in the Spirit of America Patriotic Book Series for children, “Your Vote Counts!” Grabowski and her illustrator Michelle Graham Fricks are passionate about teaching kids civics at a younger age. Even kids get to make decisions. Adults make hundreds of decisions, big and small every day. They want kids to understand that they make decisions too. MaryTherese (MT) Grabowski is creative, talented and patriotic to her core. So much so that her blood isn’t just red – it’s red, white and blue! The only daughter of six children born into an Air Force family, she has a love of country that has influenced everything in her life. MaryTherese is a retired award winning TV Journalist and spent years as an advocate for the Air Force in Washington, DC. Now she has combined two of her greatest passions, children and patriotism, into a career. Michelle Graham Fricks is an eccentric, passionate, magical thinker, and artist that has a diverse background. Another unique quality she possesses is that she remembers distinctly what it is like to be a kid. She was a military kid, but not a typical one. She was taught patriotism and serving others early in life by her father, who is a Vietnam Veteran and further served through the Air National Guard and her mother who was, and still is, a talented homemaker. Published by New York City-based Page Publishing, MaryTherese Grabowski’s teaching tale demonstrates that it is never too early to learn about the importance of voting…otherwise one might get something besides macaroni and cheese! For a kid, voting for macaroni and cheese for dinner is just as big a deal as an adult voting for President of The United States. In both cases a person wants their voice to be heard. Why is it important to vote? In “Your Vote Counts!” America Johnson learns the hard way that some kids don’t understand why they should speak up. Her dream of running for student council at school turns into an explanation to students about using their voice, making a choice and voting. Believe it or not, sometimes adults don’t understand it either. Ironically, there is a presidential election at the same time as America’s school elections. This helps her Dad explain the similarities in voting and responsibilities. Readers who wish to experience this patriotic work can purchase“Your Vote Counts!” at bookstores everywhere, or online at the Apple iTunes store, Amazon, Google Play or Barnes and Noble. More information about the Spirit of America Patriotic Book Series can be found at http://www.spiritofamericabooks.com.